As the summer was winding down, a homeowner told me of a plan to add an addition to her home. Her goals were to have addition space to her home that was based on universal design space that she could enjoy for years to come. The challenges didn’t end there! The existing home sit up on a hill and partially into a sandstone ledge. 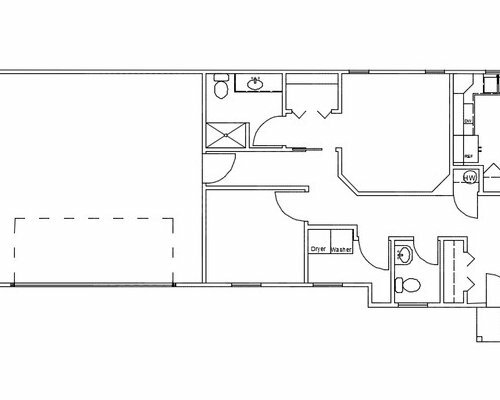 The solution had to be around 1,000 square feet, have a general sitting and casual dining area, small kitchen, general commode room, a second laundry area, two private rooms and a bathroom. AND it had to look just like the big house! Our solution was to create a mini version of the existing’s home façade (using the same rhythms and proportions) and tie into the existing home through the side-loading garage. We worked through a few different layout scenarios and finally came up with an approach that gave her all that she had listed on her wish list. The best part? We were able to deliver the views of the landscape she has loved so well! Then the real work began. Getting the various costs for all the phases of the project, getting the construction documents drawn and submitted for the permits, and staking out the foundation. 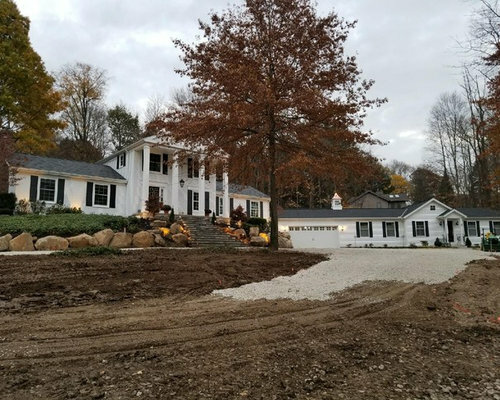 After all the T’s were crossed and I’s dotted, we were finally ready to break ground in early December, right as the coldest temperatures anyone could remember in a long time hit! 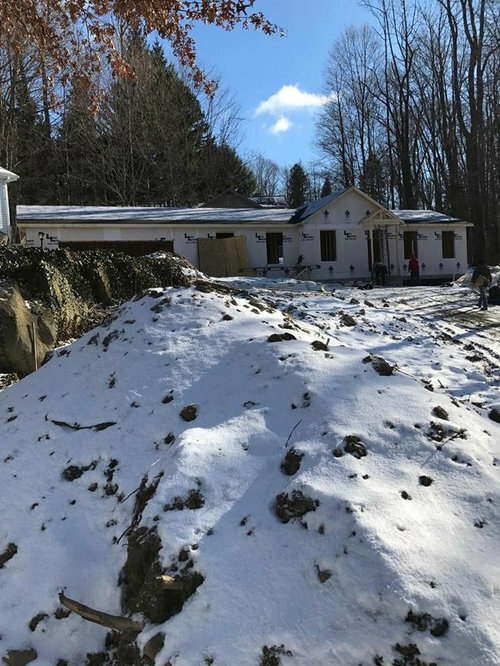 Sometimes frozen ground isn’t a bad thing, because you don’t have to worry about soil collapsing in on the footers, but when it comes to pouring concrete? Not so much. 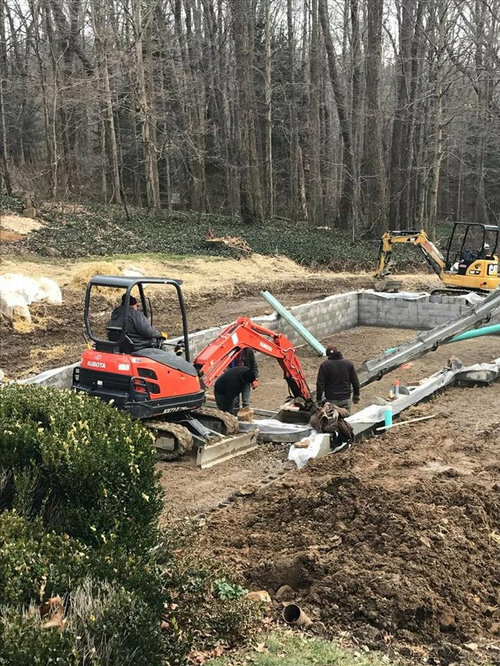 Well, we didn’t get the foundation done as fast as we would have liked, but we did get it done right, and that’s the most important thing in the long run. And the framing phase flew by and we got this up in less than a week. Check out the pictures of the project so far. 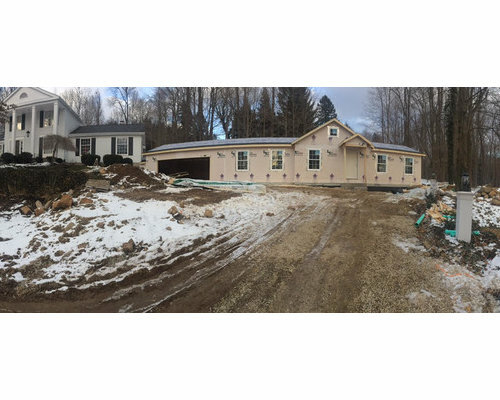 Our next step is windows, roofing, and then we’ll finish the garage floor, install the garage door, put on the siding and trim, and final grade. Inside we will be rough plumbing, run the HVAC, and rough electrical, then it’s on to drywall. After drywall the fun stuff starts! 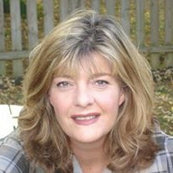 Be sure to check in as I update the site and you can follow the progress. This is a full design build project so we’ll be adding the furniture, window treatments and all the design details that make a house a home! Well, it's finally done! The homeowner was able to use the interior as early as May, but it took awhile to resculpt the terrain and landscape. When you want to use the best people, sometimes you have to wait...especially during their busy season! But the summer went by quickly and it was well worth the wait! So proud of this project!!! We are so proud of the finished addition! 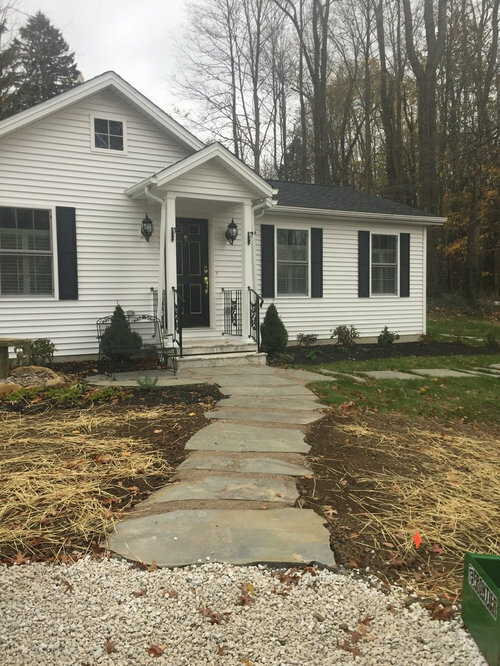 It took less than a year to design, build, furnish and decorate and the finish the final grade and landscaping. We had some very cold weather earlier than expected and it did slow things down a bit. Not only is it difficult for water based materials to set properly in cold temperatures (which is NOT a good thing!) but it wears the craftsmen out! We finally got to the crawl space pour phase. What a monumental phase completed. Next we get to see the drawings go from the 2-D to 3-D! Veiw of the tie-in roof from the dining room of the existing home. The only bummer to the whole addition is we had to sacrifice a bit of the view out the big window in the room. Good thing the addition is at a 40 degree angle; the angle still allows some of the beautiful view. Plus, the natural light is still plenty. View of the addition from a lower grade. 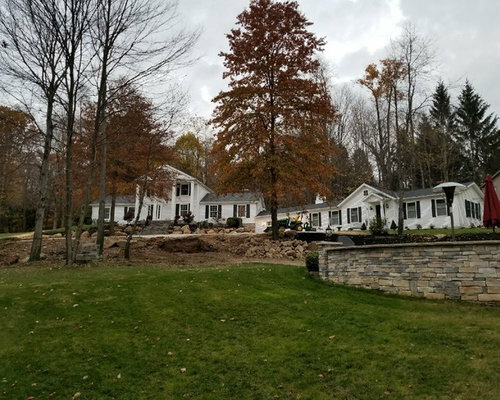 Not only was the project challanging to meet the homeowners space requirements and to tie-in to the existing home, but the property lines were very close and restrictive and the terrain had a whole new set of challanges! This had one solution and I think we hit the nail on the head! 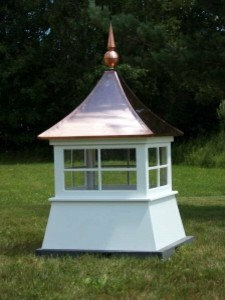 This is the cupola idea for the middle of the long roof line. Needed and welcomed! Cupola's always add a special charm. 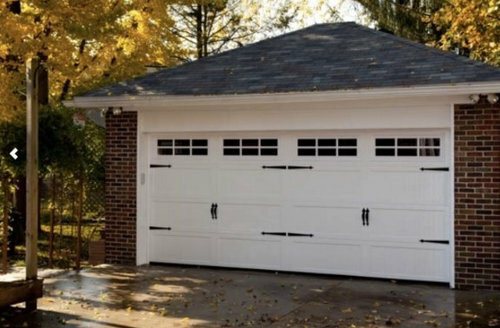 Carriage doors have been the best thing to happen to a garage since the automatic garage door opener! Now when a garage is front loading it is an asset and a real enhancer to the whole presentation. The windows are in! The windows are in! You can see from the plan, every square inch is used. That makes sense because construction costs the same per square foot whether the space is used wisely or not! The goal was to create a multi-use living and private space and we able to check off all the homeowner's wishes on her list! Including the garage, the addition is just over 1,000 sq.ft. The addition is fashioned after the bigger house to which it is attached. 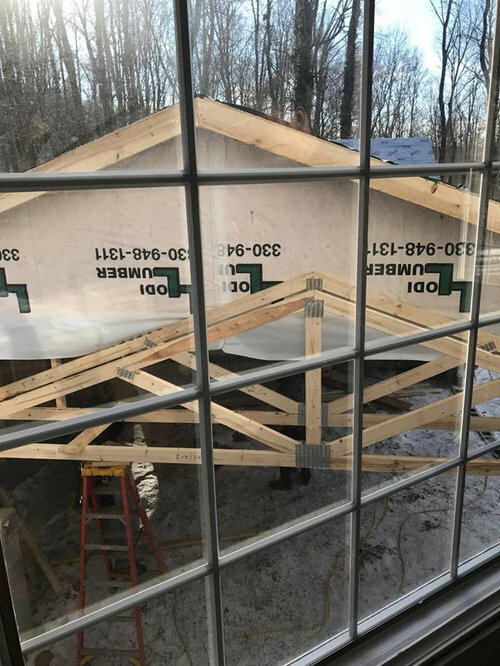 By linking the unit through the lower level, side-loading garage, we were able to minimize the disruption to the homeowners and save significant money by not altering the existing structure. The addition is at a 40 degree angle from the original structure, so it looks larger than it is. This is the three options we presented to the homeowners for furniture in the main area. Furniture is often a fluid thing and can change depending on mood and function, but always remember to anticipate your electrical needs. So, which furniture plan would you like?